Are you looking for the perfect upright vacuum that will tackle pet hair and all other pet-related messes? Something powerful and efficient, yet versatile, adaptable and easily maneuvered? 3 Buying Guide - How to Choose the Perfect Upright Vacuum for Homes with Pets? 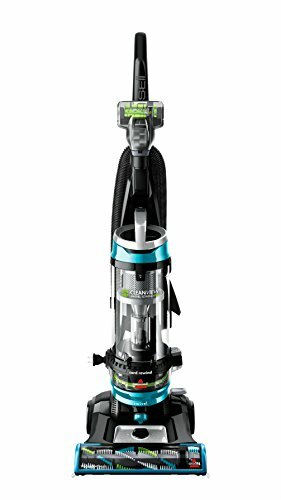 Shark Rotator Powered Lift-Away TruePet vacuums cleaner has an innovative design combining the power of an upright vacuum and the agility of a canister one. This Lift-Away feature sets it apart from other upright vacuums and makes it incredibly versatile. With excellent filtration, adaptable attachments and many convenient features a pet owner would love to have in a vacuum cleaner; this vacuum was sure to make the top 3 upright vacuums for pet hair. Click here to read user reviews on Amazon. use the hose and wand combo to vacuum underneath furniture and in tight spots where you couldn’t fit a full-sized upright vacuum. It even turns into a handheld vacuum to give those stairs a proper cleanup. You can carry the canister with you and attach tools to the hose to clean stairs, vents, curtains and even the car interior. To make your cleaning job even easier, the Rotator has LED-lights to offer visibility and fingertip controls so you don’t have to keep bending down for adjustments. It even has Dynamic Swivel Steering to help you maneuver the vacuum around furniture. The filtration has three stages with two washable pre-motor filters made out of foam and felt, and a post-motor HEPA filter. It also comes with Anti-Allergen Complete Seal Technology, which combined with the HEPA filter makes sure that only extremely clean air is blown out of the vacuum and all allergens and pollutants are left inside the dirt cup. And speaking of the dirt cup: it is a bit on the small side when it comes to capacity, but it does have an Easy-to-Empty feature which takes care of dumping the dirt with just a push of the button. No need to pull out wads of pet hair, as the content just falls out into the trash bin when the bottom of the dirt container opens. Shark Rotator Powered Lift-Away TruePet vacuum has the combined benefits of an upright vacuum and a canister vacuum. In the upright mode the floor head with the brush roll engages carpets for a deeper clean, and in the Lift-Away mode, the vacuum cleaner turns into an agile canister vacuum ready to give a thorough cleanup on hard floor areas. The Hard Floor Hero floor head is used by attaching it to the hose and wand. It has a sleek design which allows it to be maneuvered under and between low-built furniture, and it is perfect for picking up cat litter and food pellets in your kitchen. The Duster Crevice Tool, TruePet Mini Motorized Brush, and Pet Multi-Tool are what you need for above-floor cleaning. With these tools, you can tackle surfaces like upholstered furniture, curtains, baseboards, bed and car seats. The Pet Multi-Tool is very handy with its pet hair attracting lining and brush, but for really tackling that pet hair you should bring out the TruePet Mini Motorized Brush. This tool will lift up even the most persistent pet hair – long or short – and quickly push in in the suction path to be lifted up by the suction. This tool is one of the most advanced motorized tools on the market and something every pet owner would love to have. It may feel like this review is full of praises, which it is. The Shark Rotator Powered Lift-Away TruePet (NV752) is one of the bestselling pet hair vacuums, and that is for a good reason. Its performance is excellent, and so are the many features that make vacuuming quicker and more comfortable for the user. The price is reasonable, and with this kind of versatility, it’s well worth the investment. It is the most expensive one of our top three, but the features and quality it comes with back up the price tag. If you want the best upright pet hair vacuum on the market, this is the one to choose. This new upright vacuum from Bissell is packed with great features. It is designed for homes with pets, and although it has all those critical features that offer excellent performance, the price is still very moderate. Check the latest price here. 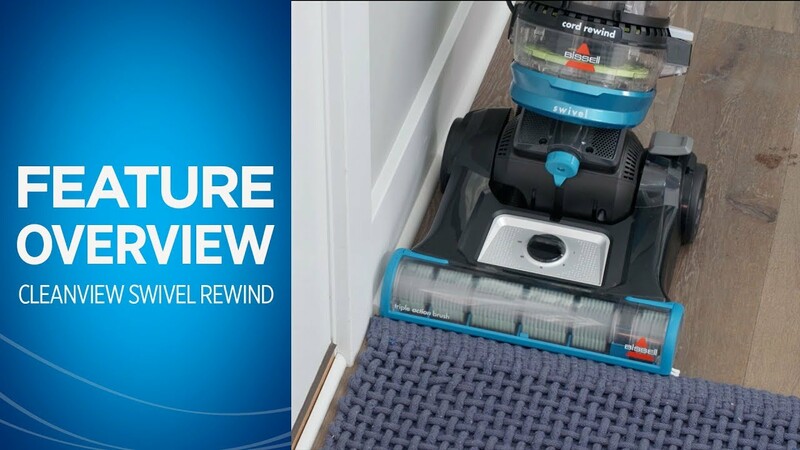 The Cleanview Swivel Rewind Pet is a new upright model from the well-known Bissell company. All though it has not been on the market for long, it has already gained excellent reviews from satisfied users. It is very easy to use, and it provides pet homes with excellent cleaning results. But are there any downsides to this vacuum? Keep on reading to find out. The main cleaning head also has what Bissell calls Scatter-Free Technology and an edge-to-edge cleaning feature. These two details make sure that dirt and debris won’t escape the suction. The scatter-free technology helps pet owners pick up spilled pet food, scattered cat litter, or dirt and sand brought in by your pet. The edge-to-edge feature, on the other hand, enables you to clean more floor area in one pass to make vacuuming a quick no-sweat job. The width of the cleaning path is 13.5 inches, and with the strong suction and brush roll being distributed evenly across the cleaning path, the vacuum makes sure every inch is thoroughly cleaned. Another detail that ensures excellent performance is the 5-step height setting on the brush roll. It will help you get the optimal clean by correctly adjusting to the surface. Although it is not very lightweight, the Bissell Cleanview Swivel Rewind Pet is easy to maneuver with the Swivel steering feature. It has a 27-foot power cord so that you can reach every corner of your home, and a cord retractor to make packing up quick and easy. With this upright vacuum cleaning is fast and effortless. It offers a careful clean on all hard floor surfaces and carpets, but it also enables you to easily clean above-floor areas with the extension hose and tools that come along. No upright is perfect without an extension hose that offers adaptability and enables you to use that strong suction on areas that gather dust and pet hair like your upholstered furniture, carpeted stairs, blinds, etc. The Cleanview Swivel Rewind Pet comes with an 8-foot extension hose that offers that much-needed reach. Also, with this vacuum, you get 4 fantastic tools that provide the versatility you need from an upright vacuum. First of all, you get two multi-use tools: a combination of a dusting brush and an upholstery tool, and a crevice tool. The first tool does a perfect job at dusting surfaces and delicate objects while the second tool lets you vacuum those tight crevices. And to make sure you can reach everywhere with these tools, you also get an extension wand. These are the basic tools, but wait – there is more. Pet owners will be delighted to hear that there are two more tools included which are highly valuable to owners of pets that shed a lot. The Pet Hair Corner Tool does exactly what it says: it gets every last hair trying to hide in those corners. But what is even better is the Pet Turbo Eraser which is a powerful motorized brush roll tool designed to lift up pet hair from upholstery and other such surfaces. It does a wonderful job at cleaning your carpeted stairs, upholstered furniture, pet bed or car seats. A highly useful tool for any pet owner battling that pet hair. The Bissell Cleanview Swivel Rewind Pet Upright uses a Multi-Cyclonic Suction System to prevent pet hair from blocking the suction and Multi-Level Filtration to ensure all those nasty particles stay inside the vacuum and are not blown out. The 1-liter Easy Empty Dirt Cup is pretty sizeable, but it could be even larger. It is quickly and easily emptied by detaching the container and holding it above the trash can while you press the button that opens the bottom of the cup. Simple and straightforward. The dirt container and separator are washable, as are the pre-motor filters. The third filter that is positioned after the motor is not washable, but it is a lifetime filter you don’t need to worry about washing or changing it. The first pre-motor filter is made of foam while the second one is a carbon filter designed to eliminate nasty (pet) odors. You can wash them under warm water and use a mild detergent if needed. Cleaning your filters will ensure they last longer – which of course cuts down the maintenance costs. The Bissell Cleanview Swivel Rewind Pet Upright Vacuum Cleaner is an excellent choice for an affordable upright vacuum for pet hair. It is one of the favorites because it has all those useful and highly valuable features that pet owners love, but no extra high-tech frills which would bring up the cost. This product is a powerful and highly rated all-around upright vacuum that will make vacuuming less of a chore with its functional design and easy-to-use features. It will definitely help you win the war against pet hair. Also, pet owners will be happy to know, that the company will donate 10 dollars to Bissell Pet Foundation for each purchase. The Bissell Pet Hair Eraser upright vacuum is the ultimate upright vacuum for pet hair and here’s why: it has been specially designed for removing pet hair and other pet-related messes, and the amazing attention to detail and unique features are why it can efficiently tackle all those cleanups pet owners encounter. Click here to read real user reviews on Amazon. Powerful suction combined with great attachments is what makes this vacuum such a great purchase. It is not perfect, but it comes pretty close. And the small downsides are made up for with some very useful details and pricing that is precisely where it should be. swivel steering makes it easy to maneuver, and the Quick Release Wand with an extension hose allows you to get to those hard-to-reach areas. 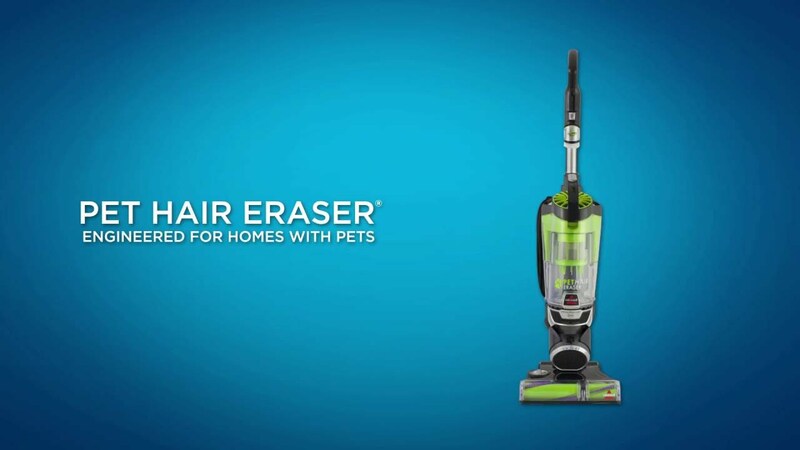 The Pet Hair Eraser upright vacuum has a large 1,5-liter washable dirt cup, which saves you the hassle of buying dust bags and allows you to vacuum heaps of pet hair before you have to empty the dirt container. It is perfect for households with many pets or pets that shed a lot because in addition to the large capacity the dirt cup also has a Pet Hair Spooling System to prevent clogging and to guarantee hands-free emptying. No more pulling out yucky pet hair out of the dirt cup with this vacuum! Unfortunately, the filtration is not HEPA level, but it is efficient and performs well. The vacuum has a SmartSeal Allergen feature which consists of a sealed multi-level filtration system that includes three filters: two pre-motor filters, one mesh and one foam, and one pleated post-motor filter. The pre-motor filters are washable, which saves money in the long run. To add another benefit for pet owners, the post-motor filter has a Febreze Pet Odor Eliminator feature to eliminate those nasty smells pets can bring to your home. Even when vacuuming damp pet hair, the air will come out clean, fresh and smelling nice. The main cleaning head has edge-to-edge suction and a unique tangle-free brush roll to offer impressive cleaning results on all floor surfaces. Four different height settings allow you to adjust the floor head specifically for the type of surface you are cleaning from plush high-pile carpet to hardwood floors. 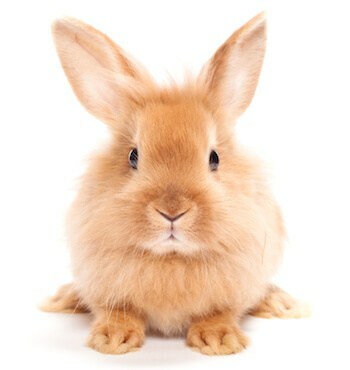 Especially owners of long-haired pets are pleased with the tangle-free brush roll! The Quick Release Wand disconnects with a push of a button enabling you to quickly attend to all those above-floor areas you come across when vacuuming. Furniture, curtains, stairs, vents… They all get a thorough cleanup with the interchangeable one-click tools specifically designed with pet owners in mind. To better serve pet owners, Bissell has integrated some ingenious details into the attachments. The crevice tool has LED lights to offer better visibility in those tight spots where pet hair tends to collect, and it even comes with a rubberized head to attract that hair. The 2-in-1 Pet Brush is designed for delicate dusting, and the Pet TurboEraser Tool will take care of tougher spots with its powerful spinning brush roll that works perfectly in picking up persistent pet hair. The Bissell Pet Hair Eraser upright vacuum has been designed to tackle all those pet-related messes, and that is what makes it a perfect pet hair vacuum. Attention to detail and convenient features are the reason it comes as number one on our list of upright vacuums for pet hair. At the price point this vacuum is at, you will definitely make a good investment should you decide to buy it. Thousands of pet owners using this vacuum and giving it praising reviews can’t be wrong and when you look at what this product has to offer you know why. This Hoover vacuum is one of the bestselling pet hair vacuums on Amazon, and for a good reason. It is powerful and efficient, and it has many convenient features to help out pet owners. It comes at an affordable price considering all the features, and users praise it for being easy to use and having good suction power. Click here to read real user reviews on Amazon. 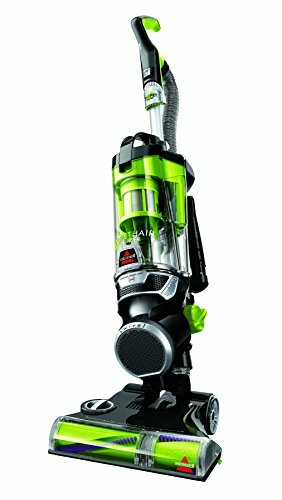 The Hoover T-series WindTunnel Pet vacuum has a traditional upright vacuum design with the pretty bulky self-standing construction. Although it is quite large and heavy, it has some nice features that add convenience and ease-of-use. these adjustments, this vacuums has excellent performance on all kinds of carpets as well as hard floors. The floor head has the WindTunnel design, which means two subsequent suction paths which minimize blowback and make sure that particles are sucked in and not scattered around. This feature is convenient when vacuuming cat litter or food pellets scattered on the floor. It is bagless with a dirt canister that is easy to empty. Some users have found difficulties with emptying the dust cup, but if you follow the instructions and do it correctly there should be no problem and all the dirt is quickly dumped into the trash. The vacuum uses a Dual-Cyclonic Air System, which separates larger debris from the finer particles before they reach the filter. By doing this, the system lengthens the lifetime of the filters and prevents them from getting clogged. The filtration is excellent in this Hoover upright vacuum: the carbon filter absorbs nasty pet smells and the HEPA filter filters out all the allergens before the air is pushed back out. Again some very beneficial features for a pet owner to have in their vacuum cleaner. The handle is foldable to allow the machine to be stored in a small space, and the 25-foot cord has a rewind function that lets you skip the hassle of coiling the power cord and trying to keep it untangled. It even has headlights to enable you to see all that pet hair and dust that accumulates under the bed and large pieces of furniture. With the Hoover T-series WindTunnel Pet vacuum cleaner, you get a very nice set of attachments which will help you with above-floor cleaning. The vacuum itself is somewhat bulky like most upright vacuums are. The sturdy design offers power and efficiency, but you need convenient and functional attachments to make sure you can reach all the areas of your home that need vacuuming. To offer that much-needed reach, this Hoover vacuum comes with a 4-foot extension hose and a 12-inch wand. You can attach the flexible crevice tool at the end to make cleaning of the baseboards and vacuuming between cushions comfortable and easy. Some users say the extension hose is short but adequate for most cleaning jobs you find at your average home. To take care of the pet hair accumulating on your furniture and bedding, you get two amazing attachments: a Pet Upholstery Tool and an Air-Powered Pet Hand Tool. The edge of the upholstery tool has a lining which attracts pet hair, and it can be used on more delicate fabrics like curtains and cushions to remove loose pet hair. For a deeper clean on carpeted stairs and tougher fabrics and to pull out that stubborn embedded pet hair, you can change to the Air-Powered Pet Hand Tool. With its spinning brush roll and stiff bristles, it can dig into carpets pulling out all dirt, hair, dander, and dust. The attachments ride along with the vacuum, which is convenient as you have them at hand at all times and they don’t go missing. They also have folding handles, which saves storage space. All in all, the attachments of this Hoover upright vacuum are a well-designed, user-friendly and great for pet hair. With this vacuum cleaner, you get good quality and excellent features at a mid-range price. For the price you pay, you get many great features like HEPA filtration, carbon filtration for odors, the cord retractor, and an Air-Powered Pet Hand Tool. It’s definitely worth the investment if you’re looking for a practical upright vacuum for pet hair with all the needed features at a reasonable investment. The Eureka PowerSpeed upright vacuum is a great budget option with the necessary features every pet owners needs. High performance combined with useful details like a huge dirt cup, motorized brush roll tool for pet hair and other handy tools. Click here to read user reviews and see the latest price on Amazon. It might not have all the bells and whistles, but this new upright vacuum from Eureka has everything you need for pet hair removal. It is a budget option for pet owners looking for an upright vacuum with a large dirt cup, strong suction and a motorized brush roll tool to effectively remove pet hair. The Eureka PowerSpeed upright vacuum is a bestselling vacuum that gets excellent reviews from pet owners using it. If you want to know more about this vacuum, then continue reading. The 25-foot cord is fairly long, and the vacuum has an automatic cord retractor which makes it easy to pack it up. With a push of the button, the cord is quickly whipped inside the vacuum minimizing the hassle. The main cleaning head has a strong suction and powerful brush roll which together will wipe out all kinds of dirt. The brush roll will pull up pet hair from carpets, and it has a 5-step height adjustment feature to get the perfect clean on all types of surfaces. Also, the 12-inch cleaning path ensures you get more floor area vacuumed with each pass. Other details that make vacuuming a breeze for you are the LED headlights that offer better visibility under furniture and the 10’ extended reach feature with the hose that allows you to get to those hard-to-reach areas like vents, fans, and ceilings. Some users find the vacuum to be a bit loud and some find it cheap looking. But at this price, you can’t really expect to get a Dyson. What you can expect though, is a well-performing upright vacuum with all the features that you would want to find in a pet hair vacuum. These tools are precisely what you need to keep your home pet hair-free. With the crevice tool, you can get to all the pet hair that tends to collect in small crevices and between cushions. You can also use this attachment to vacuum baseboards. The dusting brush, on the other hand, is a great tool for dusting. Traditional dusters can waft dust, dander, and other allergens into the air, but using your vacuum cleaner and a dusting tool will make sure all those nasty particles are sucked into the vacuum and filtered. The upholstery tool is something you can use to give your furniture a quick cleanup before the guests arrive, but if you really want to give that couch a thorough cleanup, you might want to bring out the Pet Tool. It is a motorized brush roll tool that allows you to carefully clean car seats, upholstered furniture, pet beds, carpeted stairs, and other such areas. The motorized brush roll is especially effective with pet hair and can remove it quickly and easily from all surfaces. Pet owners will also appreciate the huge 2.6-liter dust cup that will be able to take a massive amount of pet hair. It is also a Flip-Bottom Dust Cup making it easy to empty once it gets full. And because the dirt cup is enormous and the vacuum uses cyclonic airflow pet hair won’t block the air flow easily. Just remember that although the container is large, it should be emptied regularly to prevent loss of suction. The vacuum has a foam filter that can be washed and reused to avoid maintenance costs. We always prefer seeing a HEPA filter in vacuums, but since the price point is low, it’s understandable there isn’t one. For most people, this type of filtration is enough, but if you have allergies, you might want to consider one of the vacuums with a HEPA filter. At this price point, you can’t expect to get everything, but when you compare the price and what you get, it’s totally worth the investment. The Eureka PowerSpeed vacuum is incredibly lightweight, and it provides very good cleaning results on carpets as well as hard floors. With the extension hose, wand and tools this vacuum is an all-around vacuum you can use on all surfaces of your home. Pet owners will love the large dirt cup and motorized brush roll tool for wiping out pet hair. And you shouldn’t forget about some of the little details like LED lights and Flip-Bottom Dirt Cup that make vacuuming a whole lot easier. It isn’t a top-notch vacuum, but neither is the price. If you’re looking for the best budget option for wiping out pet hair, then you should choose this product as your upright vacuum. It has all the right features to be a valuable tool in any pet home. Buying Guide - How to Choose the Perfect Upright Vacuum for Homes with Pets? Are you looking for the ideal upright vacuum to win the battle against persistent pet hair? This is what you need to take into consideration when choosing the right product for your needs. Of course, the most important aspect of any vacuum cleaner is its ability to perform and deliver excellent cleaning results. All other features are pointless if the vacuum doesn’t do its job. PetHairPatrol is all about the battle against loose pet hair and other pet-related messes, so all the vacuums carefully chosen to our top 3 recommendations offer superb results especially when it comes to pet hair. As you probably know, pet hair can be one of the toughest things to clean up, and that is why you need to find a top-grade pet hair vacuum to keep your home tidy. All of the upright vacuums we have listed are corded to offer maximum power for the suction. Keep in mind though, that suction power is not the only factor affecting performance. You also need functional attachments, that suit your cleaning need. Upright vacuums are often considered bulky and heavy. For other people, this implies power and capability, for others lugging around a massive machine to do your cleaning. To be fair, most upright vacuums are much lighter than they used to be. 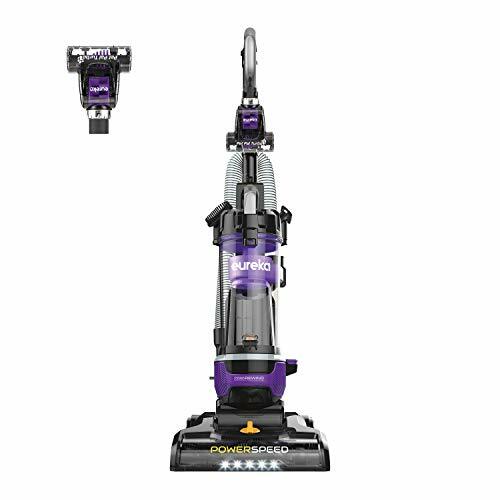 The design is still bulky compared to stick vacuums, but they do also have a stronger suction and wider cleaning path. When choosing an upright vacuum, you need to figure out how important size and weight are for you. Big size keeps you from vacuuming under furniture and can be a problem when storing the vacuum. Most upright vacuums have a solution for reaching under low built furniture; some offer a hose and wand, other a detachable handheld vacuum. When choosing your vacuum cleaner, keep in mind the kind of furniture you have at home. Which type of features would work the best? The weigh is another thing to keep in mind. Upright vacuums are designed to be pulled and pushed around, not lifted. Although the wheels and swivel head enable easy maneuvering, this type of vacuums can be heavy and not suitable for carrying around. For some people, the sturdy design is no problem, but for others, it can be an important factor. If you have carpeted stairs, do you need to pick up the vacuum as you go, or is there a feature that allows you to use a specialized tool attached to a hose without lifting the machine itself? Is there a feature to enable easy vacuuming of above-floor surfaces? You can find the weight of our top 3 upright vacuums for pet hair in the comparison table. This should help you find the right vacuum for your needs. The first and most crucial attachment in upright vacuum cleaners is the main cleaning head. Often it is not actually considered an attachment, but it is the most important tool in a vacuum of this type. For the cleaning head to actively pull up pet hair from carpets, it needs to have a spinning brush roll. All of the vacuums in our top 3 listing have this feature because it is the best tool for picking up pet hair and thoroughly cleaning carpets from all kinds of dirt. To optimize the cleaning results when moving to hard floors, the brush roll should have some settings. Usually, you can set the height or speed of the brush roll, or the vacuum does this automatically. Height settings make sure all kinds of carpets and bare floors are properly engaged by the brush enabling thorough cleaning, and lower speed makes sure debris isn’t scattered on hard floors. Also, the bristles should be able to deal with many kinds of dirt, dust, and debris as well as hair. Some vacuums offer a tangle-free brush roll, but even without this specific feature, the brush should be designed so that pet hair won’t tangle around it or prevent it from spinning. In addition to the primary cleaning head, you should have at least the basic attachments to provide adaptability and enable cleaning on other surfaces than just floors. A crevice tool is something that is always handy, as is a dusting brush. These are tools that come along with all vacuums. If you need to vacuum furniture and you want to do it effectively, you should make sure the vacuum has a special upholstery tool designed for pet hair. The most efficient ones are the motorized brush roll tools, which meticulously brush the surface of upholstery fabrics lifting up dust, dander and pet hair. To use the provided attachments you should also have a practical system for attaching them on the vacuum. Many upright vacuum cleaners have a hose and wand structure, which provides the powerful suction of the upright vacuum and enables you to reach surfaces high and low. The Shark Lift-Away feature is a different approach, with a detachable motor and dirt container, which leaves you with the sleek and lightweight wand you can use for tight spots and cleaning up high. 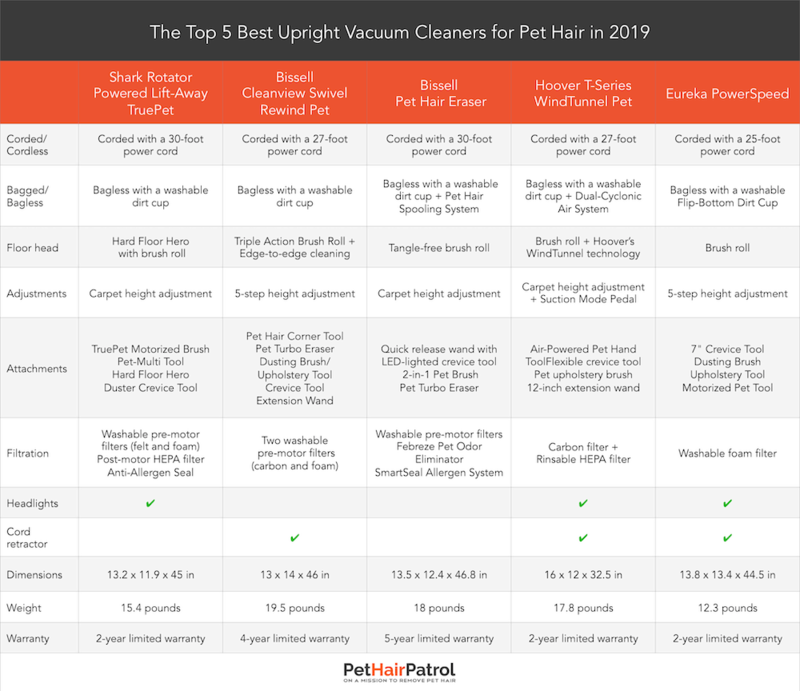 Our comparison table introduces you to all the attachments our top 3 upright pet hair vacuums come along with. Also, check out our full reviews for more details. Upright vacuums used to be mostly bagged, but nowadays they come with a washable dirt container and many kinds of filtration systems. Some offer cyclonic filtering, which is an effective way to filter all dirt from the air. By cleaning the air with a cyclonic system before it is guided through the filter, you can prevent the filter from clogging and lengthen its lifetime. Other details you should take into account are the materials filters are made of, are they considered to work well and whether they a washable. Having washable filters saves you the cost of replacing them every few months. Another important detail specifically for people with allergies is whether the filter is a HEPA filter and if the system is sealed. HEPA filters will filter out all allergens, but only if the system is appropriately sealed not to let any air escape the system before going through the filter. The type of floor surface you have at your home should be taken into consideration when picking the perfect vacuum cleaner. If you have wall-to-wall carpet or thick rugs, an upright vacuum should be your choice. With the power and weight of the upright vacuum, you will be able to give your carpet a deeper clean than with another type of vacuum cleaner. With their powerful brush roll, upright vacuums can dig deep into the carpet and remove all dust and debris. Upright vacuums work well on carpets as well as hard floors, but for the ideal cleaning result, you need to have some adjustments available. Adjusting the height of the brush roll and the strength of the suction enable you to move from carpet to floor without losing the cleaning power. In some upright vacuums, these functions are automated, which makes the job even easier for you! If you have large pieces of upholstered furniture or you would like to use the vacuum cleaner in your car, you need to have some sort of hose and a special upholstery tool. With a motorized brush roll tool, you will be able to get all that stubborn pet hair off your recliner in no time! When choosing the vacuum cleaner you should take into consideration the surfaces it is used on and whether the vacuum has the right features for the purpose it is intended for. The top 3 products we have listed have amazing performance on carpets, hard floors and above floor areas alike. Each one is a great choice no matter what the decor in your home looks like. Upright vacuums used to be mostly bagged, but nowadays more and more vacuums have washable easy-to-empty dirt canisters. The positive aspect of having a washable container is the fact that you don't have to keep buying dustbags, which saves you money. On the other hand, removing a dustbag can be more hygienic depending on how well the emptying system of the canister has been designed. Luckily, the well-known vacuum cleaner brands do spend time and money on the design, which means that the containers are often easy, quick and hygienic to empty. You can read more about this feature in our full reviews. When it comes to the price, there are some good options in every price range, but you can't expect to get all the attractive features in the lower price categories. A vacuum cleaner is something that will last for many years if it is durable and high-quality, which is why you should not skimp when buying one. Vacuuming your home is a burdensome job as it is, and your vacuum cleaner should make the job easier. If getting the vacuum out annoys you because it isn't well-designed or it doesn't have the right features, you won't be spending much time vacuuming, and you will have wasted your money. It's better to invest in something that is convenient and has all the right features, because only then will you be able to enjoy vacuuming and actually use the product you've invested in. Is an upright vacuum the right choice for me? Upright vacuums are at their best on carpets. They may be heavy, but the sturdy design allows them to apply pressure on the carpet for the brush roll to dig deep between fibers. Upright vacuums are usually corded to have the maximum power for deep cleaning in tough areas such as thick carpets. This type of vacuum is the best choice for someone having carpets and big area rugs in their home. Upright vacuums usually have a switch to change the brush roll setting from carpet to hard floor, or the vacuum does this automatically. With a change of settings, the vacuum performs better on hard floors without scratching the surface or scattering larger debris. To add versatility, most upright have some kind of system for above-floor cleaning. Because the vacuums itself is too heavy to be lifted, the design includes a hose with a wand or such to offer reach and enable cleaning in all hard-to-reach areas. The problem with upright vacuums is that it can feel burdensome to get the vacuum out and plug it in for small cleanups. If you don’t have carpeting and you think a lighter vacuum cleaner could do the trick, have a look at our top 5 stick vacuums for pet hair. Alternatively, if you need a sturdy vacuum, but you feel an upright vacuum is too bulky, your choice could be one of our top 3 canister vacuums for pet hair. An upright vacuum should be your choice if you're looking for a robust and powerful vacuum to be the primary vacuum of your home and to do weekly cleaning. It is the best choice for homes with medium and long pile carpeting, and anyone looking for a very strong vacuum for tough jobs. Can an upright vacuum wipe out pet hair? Upright vacuums are the most powerful type of vacuum. They have big powerful motors which give a strong suction and sturdy design to apply pressure to the area being cleaned. Usually, they also have many useful features and attachments which provide them with versatility. With all these features an upright vacuum is perfect for removing stubborn pet hair. An upright vacuum is the number one choice if you are looking to thoroughly clean carpets removing all pet hair, dust, dirt, and dander. Their powerful brush rolls do an excellent job at it when you're working on the floor. And when you need to apply that strong suction on above-floor areas, you can choose the right attachment to make sure you get the cleanest of cleans. So yes, an upright vacuum can certainly wipe out pet hair. How to choose the right upright vacuum? Upright vacuums can have a bulky design, and many manufacturers have tried to come up with new kinds of design to offer more versatility and maneuverability. When you're looking for an upright vacuum, you need to decide which features will be the most beneficial for you. A pet owner will need functional attachments and something that enables cleaning furniture and other above-floor areas. A brush roll tool is the most effective for pet hair on upholstery, but you also need a crevice tool to get to those tight spots and maybe some other tools for other surfaces. The hose and wand used with these tools should be long enough, or you need a vacuum with a 2-in-1 design with a detachable handheld vacuum. All of the upright vacuums in our top 3 list have excellent suction power and functional design. They are good at removing pet hair from different surfaces, and they also deal well with other pet-related messes. For you to find the right upright vacuum for yourself, you should consider your needs. Do you need to vacuums stairs? Then the upright vacuum should have a very long hose or lightweight design to be easily carried up the stairs with you. If you need to vacuum under furniture, maybe you need a vacuum with slim design or a detachable wand. The size of the dirt cup can be a deciding factor if your pets shed a lot, or maybe you have sensitivities and need a HEPA- filter. To find the right upright, have a looks at our reviews and comparison table. With the information provided you will be able to compare these top upright vacuums against each other to find the perfect match for your home.